Over the past few months, we have been continuing our focus on raising the profile of the Centurion brand through continued global activation of our new brand and vision. This involved working with our valued partners, end-users, and team to truly understand the needs of the market. At Centurion, we are problem solvers at heart and we obsess about understanding and solving problems for end users. Recently our sales promoter in Iberia, Javier Peris Ronquillo, spoke at ANETVA – the Work at Height Spanish National Association Seminar. ANETVA is one of the most important associations for working at height in Spain and a crucial part of ECRA – an organisation made up of key associations specialising in working at height. Javier met with 25 attendees to review and train in the Nexus Heightmaster safety helmet system. Not only was it reassuring to witness great demand for the new working at height helmet, but it was also beneficial for us to gain an insight into next generation developments. 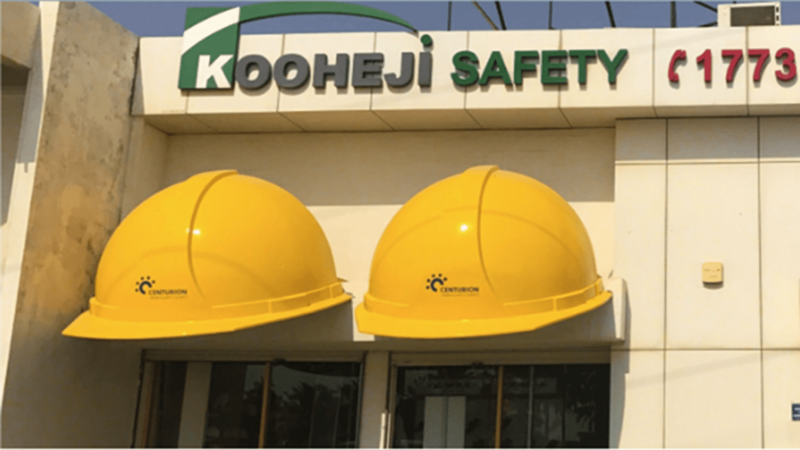 Our valued partner, Kooheji Industrial Safety, based in Bahrain, has further enhanced the visibility of the Centurion brand by promoting our range of helmets through an innovative display outside of their trade shop and main headquarters. Branding the four, larger than life, locally renowned display helmets, has further signaled our intentions to strengthen relationships with key strategic partners and increase Centurion brand awareness in the Middle East region. June marked our first major opportunity to actively display our new brand and vision at an event in North America. Our valued partner, MPS, exhibited at ASSE – the annual US safety conference that saw more than 4,000 safety professionals come together. It was the most successful ASSE that MPS has attended, and there was a lot of interest in our ranges, in particular our multi award-winning Nexus system and our bump cap protection systems. As we continue to globally activate our new Centurion brand, products and vision, we have specific focus on the biggest health and safety exhibition of the year, A+A Dusseldorf, this October. Please keep an eye out over the coming months to see the exciting developments and innovations at Centurion. Don’t miss the chance to visit us at hall 6 stand B38.